Typically, the threat of a computer virus prompts users to click links which will download malware and infect a user’s device. At this point, it’s possible that credit card data can be captured, credentials stolen, or a device or computer compromised. 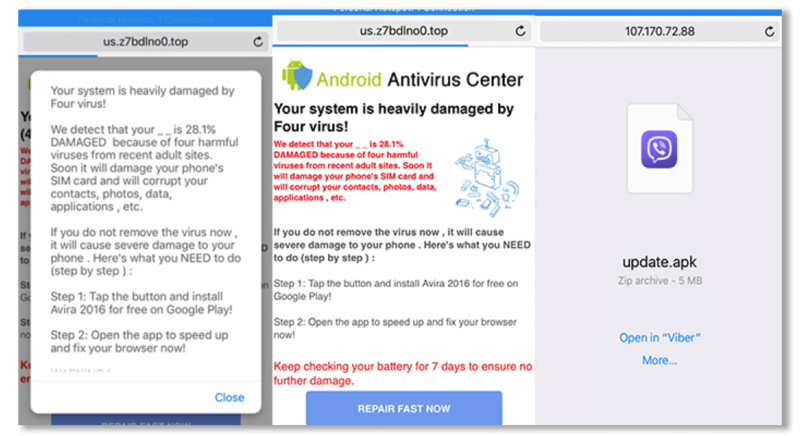 In some instances, clicking the link to fix a fake virus may uninstall legitimate antivirus software, leaving a computer, mobile device, or network vulnerable to attack. IRS Spoofs. The IRS means business, so when we think they need to speak to us with regards to some tax problem, most of us don’t hesitate. Preying on this fear using scareware can be problematic for security teams. An effective way to stop these types of scareware phishing threats is to use zero-hour, real-time phishing threat intelligence. Unlike other anti-phishing technologies and threat feeds, our Real-Time Phishing Threat Intelligence covers all six major categories of phishing and social engineering threats. Credential-stealing, phishing exploits, social engineering scams, rogue software, phishing callbacks, and scareware. See what scareware phishing threats and social engineering attacks your organization is missing. Try SlashNext Real-Time Phishing Threat Intelligence free for 15 days.